Multivariate Testing and A/B Split Testing – who provides it? We’re seeing growing interest from site owners in doing A/B split testing and multivariate / multivariable testing – for landing pages, for product pages, for buying processes, for e-mails and so on. But who are the service providers out there specialising in offering such solutions? We (E-consultancy) are looking at doing some specific content and events (roundtables, training and so on) around the topic of testing and optimisation as we see it as an enormously important topic going forwards. At this stage we’d be interested to know whether you think the topic is of interest, and also who you know out there that specializes in this area? Have you got any experiences, recommendations or suggestions to share? Feel free to put yourself forwards if you are a supplier / agency! (NB I’ve left out a whole load of online advertising optimisation solutions, including the behavioural targeting crowd here – in theory these can of course be used to serve and optimize content on your own site, not just your ads on other sites. God provided a great model for communication when he gave us two ears and one mouth. But marketing - the function that leads customer dialogue – tends to focus on outbound communication. In today’s web connected world, is that still an appropriate model? 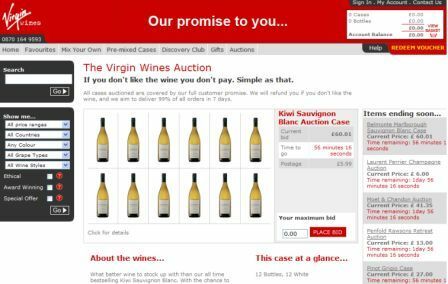 Virgin Wines has relaunched its website, giving it a new look, and has added a new auction feature, so customers can bid against each other for cases of wine. eBay has launched a Flash widget applet that allows sellers to embed their auctions on sites around the web. The auction site has billed the move as “a fun and easy way for you to share the interesting things you’ve discovered on eBay and personalise your blog, social networking page or website”.